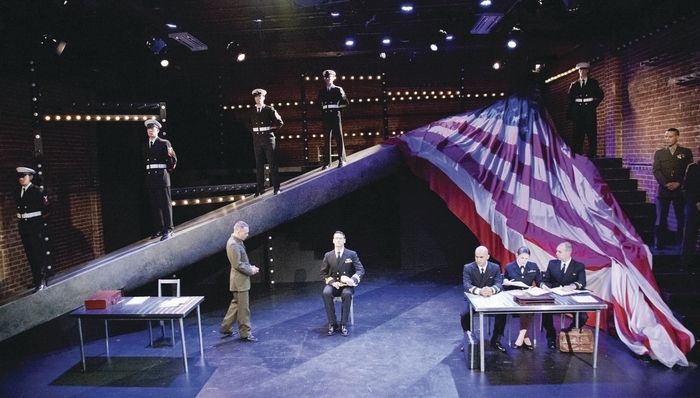 Presented by Keegan Theatre all the way from Washington, USA, A Few Good Men comes to the Mullingar Arts Centre for two unrivaled performances on September 5 and 6. A Few Good Men is an American courtroom drama telling the story of the trial of two marines put on trial for complicity in the death of a fellow marine at Guantanamo Bay. The navy lawyer, a callow young man more interested in softball games than the case, expects a plea bargain, and a cover-up of what really happened. Prodded by a female member of his defense team, the lawyer eventually makes a valiant effort to defend his clients and, in so doing, puts the military mentality and the marine code of honour on trial. Having had Broadway success in the 1980s, A Few Good Men was then adapted to screenplay for a 1992 film starring Tom Cruise, Jack Nicholson, and Demi Moore. A Few Good Men is a riveting courtroom drama that investigates both the nature of military mentality and the marine code of honour. A Few Good Men comes to the Mullingar Arts Centre on September 5 and 6. Tickets are €18/€15 and are available from the Mullingar Arts Centre by calling (044 ) 9347777.